Wrongful Death Funeral Costs and Out-of-Pocket Damages | Hupy and Abraham, S.C.
As you mourn the untimely death of our loved one, financial concerns may become a very real and overwhelming concern. Your family’s income has changed without your loved one working and at the same time your expenses have increased. As you grieve, it is important to protect your financial rights so that your troubles do not mount and so that the person who caused your loved one’s death does not cause your family further harm. Funeral costs. Funeral costs include things such as a funeral or memorial service, pick up of the body, preparing the body for burial, a casket, visitation hours, a hearse and other vehicles, a cemetery lot, cremation costs including an urn, and a tombstone or other marker. Household help. This may include any expense made necessary by your loved one’s death including childcare help, cleaning help, or maintenance and repairs. Property damage. You may be able to recover for the cost of your loved one’s vehicle or other property that was destroyed in the event that led to his death. Any other out-of-pocket out costs should also be included in your recovery of wrongful death damages. 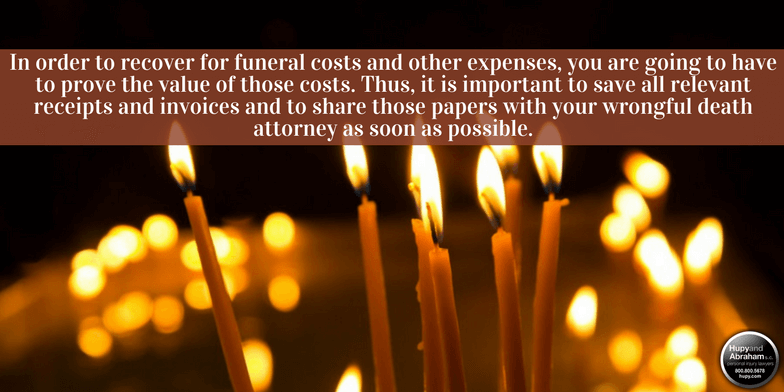 In order to recover for funeral costs and other expenses, you are going to have to prove the value of those costs. Thus, it is important to save all relevant receipts and invoices and to share those papers with your wrongful death attorney as soon as possible. Your lawyer can let you know what costs may be part of your damage award, how to protect your rights, and how to get the recovery that you deserve. For more information, please contact us at any time via this website or by phone. We would be pleased to discuss your entire wrongful death claim and potential recovery with you during a free and confidential consultation.